East Africa, the area stretching from Ethiopia in the north to Mozambique and Madagascar in the south, has become the most exciting region in the world for colored gemstones. It started back in 1967 with the discovery of tanzanite and tsavorite garnet in the border region of Kenya and Tanzania. Since then the list of important gems discovered in the region has grown to include ruby (Madagascar, Tanzania and Mozambique), sapphire (Madagascar and Tanzania), spinel (Tanzania), opal (Ethiopia), zircon (Tanzania), tourmaline (Mozambique) and aquamarine (Mozambique and Madagascar). Of all the East African countries, Tanzania has produced the greatest variety of high quality gems, including some world class material such as the neon spinels from Mahenge. This month we look at the range of fine garnets from Tanzania and neighbouring East Africa. Tanzania and Kenya are most famous for the chrome green tsavorite garnet, which many gem dealers regard as the finest green gemstone in the world. Rivalling top emeralds for color, tsavorite has a higher refractive index, superior clarity and is always completely untreated. But it is very rare in sizes over 2 carats. But tsavorite is not the only rare garnet found in East Africa. 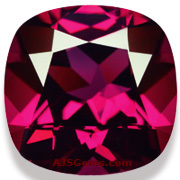 There are also top grade examples of rhodolite, malaia and color change garnets. Some of these garnets are unique and not found elsewhere in the world. The rhodolite garnet from the Umba River region of Tanzania is a good example. Rhodolite is a mixture of almandite and pyrope garnets, and is highly regarded for its purplish-red color, with no trace of brown. But most rhodolite tends to be quite dark in tone. 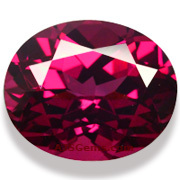 The rhodolite from the Umba River is so bright and vivid that it has been named Umbalite Garnet in the trade to emphasize its unique qualities. 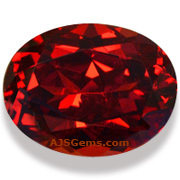 Malaia garnet is another rare garnet hybrid that is found mainly in East Africa. A mixture of almandite, pyrope and spessartite, it was first discovered in the Umba River region of Tanzania in the early 1970's. A second deposit was found in southern Tanzania in 1993. The colors range from slightly pinkish orange to reddish orange or yellowish orange, with tone ranging from light to dark. Sometimes sold under the name Imperial Garnet, it is sought after by garnet collectors for its rarity. 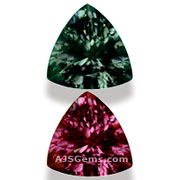 A color change garnet with a strong color shift has been found in Kenya and Madagascar. These rare stones display a deep green or blue green under natural light and red or purple under incandescent light. 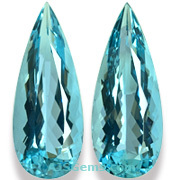 Some of them display a strong color change that rivals top grade alexandrite, at a fraction of the price. This month we feature important new acquisitions, including a top chrome tourmaline, a fine unheated Ceylon sapphire and a rare Russian demantoid garnet. A gorgeous chrome tourmaline in an unusually large size. This gem is a lovely pure green, with neither a yellow nor a blue secondary hue. The color is open and bright, unlike most chrome tourmalines in larger sizes, which tend to be dark. This is an exceptionally clean stone -- we've graded it loupe clean -- and nicely cut with a very pleasing shape. All in all, a very fine gem sure to please the most discerning collector. See the video. 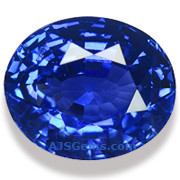 A gorgeous unheated Ceylon sapphire over 2.5 carats. A bright saturated royal blue, this fine sapphire displays a vivid blue and full fire under any lighting. Perfectly sized for a special ring, this lovely gem is certified as unheated by GemResearch Swisslab (GRS), with origin stated as "Sri Lanka". An exceptional Demantoid Garnet from the classic location in Babrovka, Russia. This fine gem is exceptional in several respects, from its excellent saturation to its remarkable clarity and impressive size. Beautifully fashioned in a well-proportioned pear, this Demantoid has all the fire and sparkle one expects from a top grade specimen. Though the gem is quite clean, a subtle horsetail inclusion is visible under magnification. In short, an outstanding specimen for the serious collector. A fine example of the "Umbalite Garnet" from Tanzania. Rhodolites from these region tend to be especially bright and lively. This 3.48 ct square cushion displays beautiful crystal, and we've given it our highest clarity grade ("loupe clean"). Gem-quality Rhodochrosite is rare, and even fine material can only be cut as cabochons. Facet-grade material is almost unknown. 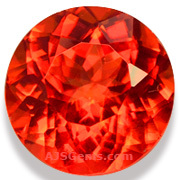 This stunning orange faceted rhodochrosite from South Africa is the rare exception. A true collector's gem. The engagement ring that Napoleon Bonaparte gave to Joesephine de Beauhamais in 1796 was sold at auction for $949,000 in France. The ring features a pear-shaped sapphire and a pear-shaped diamond with a total weight of less than 1 carat. According to the Osenat auction house, the ring had an estimated value of $20,000, not including the historical premium. Napoleon purchased the ring while he was still a poor army officer. Despite the modest ring and their divorce 14 years later, Josephine was said to have cherished the ring and handed it down as a family heirloom. In crime news, last month we wrote about the gang that made off with $50 million in diamonds from the Brussels airport. Jewel thieves in Saudi Arabia were not as lucky. Seven thieves convicted in 2009 of armed robbery of jewelry stores were publicly executed last week, reportedly by firing squad rather than the more customary beheading. Human Rights Watch earlier this month had called for the death sentences to be cancelled because the men were juveniles at the time of their arrest. 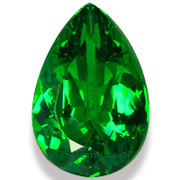 The Russian demantoid garnet is valued not only for its rarity but also for its quality. Though demantoid garnet has been found in other locations, notably Namibia and Madagascar, the quality of the top Russian material is far superior. The African demantoid tends be yellowish green, olive green or brownish, due to higher concentrations of iron. The Russian demantoid is colored by chromium and tends to be a pure vivid green. The Russian material often displays a unique horsetail inclusion. 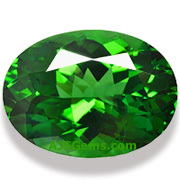 Some demantoid which is dark in tone is heated to lighten the color, but the unheated material is always more valuable. For more information see our article on Russian Demantoid Garnet. We try to display as much of our collection as we can on our website, but we generally have a number of gems that are not online, for a variety of reasons -- we are taking photos, or we are showing the gem to a customer, or the gem is at the lab for certification. So please contact us if you're looking for something you don't see on our website.